Bought this board with a cabinet. This is one great dartboard. 99% of the soft-tip darts stick in the board no problem - if they don't, you usually missed the dartboard. The games included are enough for most players. My wife and I have played on this board numerous times since we bought it, and she's become a master. I'm still trying to catch up to her skill level. My only complaint is that the LED's for the 3 statuses for Cricket are sometimes confusing. Green and Yellow can look somewhat similar 8 feet away from the dartboard. 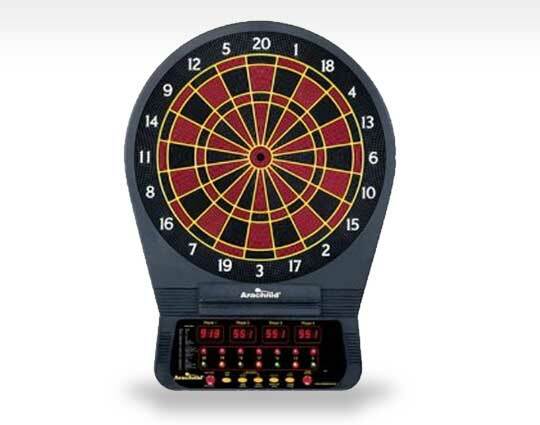 I would have liked to have the X and O like the Arachnid 800, but this is probably the best bang for the buck dartboard out there if you want high quality (not kiddie), and enough features for everyone but the most die-hard professional. PS - the darts can be somewhat difficult to remove from the dartboard, as my wife has experienced. If you get the right type of darts (shorter tips & fatter bodies. . .I think the 1/4" are better), it becomes easier to remove. This is a well made and fun product! We play it daily. Friends that come always want to buy their own. The only thing I suggest is you buy some good darts to go with the game. The ones that come with it are not very good. Arachnid CricketPro 650 Electronic Soft-tip Dart Game features: 8 player Cricket - 24 Games - 132 Options, Regulation 15.5" target area, 8 player score display, 5 cricket games, LED display of player game scores and cricket displays, Tournament spider and trademarked tournament colors, Micro thin segment dividers dramatically reduce bounce-outs, NylonTough segments improve playability and durability, Single in/out & double in/out features, Voice prompt for player to throw, Solo play feature, Player handicap feature, Sleep mode and reset features, Includes 6 soft-tip darts & extra tips, AC adapter, Mounting hardware, Game instructions, and Operating manual. One year warranty against defects.